The term 'roulette odds' is used to describe the mathematical proportion of winning a certain bet to the quantity of this bet possible losses in a roulette game. 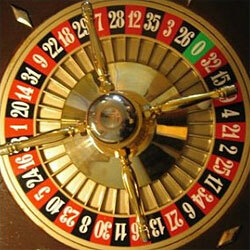 The most confusing thing that concerns roulette odds is about the roulette probability changes. Particularly, the question is the following: whether the probability of winning changes after several successive bets, for example, on Red, Black and again on Red? The answer is genius in its simplicity: roulette probability always stays constant due to the fact that roulette wheels have no memory and they do not track the slots that won previously. In other words, as the wheel does not bother about the previous results, so neither player should do this. The thing that really makes difference for roulette odds and, what is more important - for roulette payouts, is the type of the roulette game. Without any doubts, European roulette provides you with an additional advantage thanks to its single-zero wheel. Moreover, a lot of European games are supposed to include particular special bets, while American roulette proposes only a 'five number' (1, 2, 3, 0, 00) bet with a large house edge. Important thing that players should keep in mind is that different types of bets assume particular roulette odds which vary among each other. A clever gambler needs to know clearly all odds characteristics in order to elaborate a strategy that is suitable for him/her. column/dozen bets differ from other outside bets and provide higher odds of 2.167 (2) to 1 and, consistently, a higher payoff of 2-1. It is easily observed that the roulette probability for each outside bet is just a little less than 50% and payoff for the majority of bets (except dozen and column bets) is simply even money. five numbers bets have 6.6 (6) to 1 odds with payout of 6-1. The 'five numbers' bet is sometimes also called a 'sucker bet' because this bets offers the lowest payout and includes the highest roulette house edge.